In a Nov. 3 tweet, radio host Mark Madden posed a question to his Twitter followers: “Should NHL reinstate domestic abuser Slava Voynov? Should misdemeanor domestic assault = death sentence for his NHL career, even after 4 years out of the lg, over $16m in lost salary, 2 months in jail& having served probation?” This tweet included a link to his Trib Live article that discussed how the chances of the Russian forward returning to the NHL look slim. Key words: death sentence. Madden is comparing Voynov’s potential inability to return to the league to a death sentence. This rhetoric is incredibly toxic, and labeling it a “death sentence” is an attempt to minimize the fact that this player was actually convicted for domestic violence. In 2014, Voynov was arrested for pushing, hitting, choking and kicking his wife, Marta Varlamova. He served 60 days in prison, which The Los Angeles Times reported was a “pay-to-stay” jail, three years of probation and community service. Sure, this was labeled as a misdemeanor, but just because Voynov served his sentence does not mean he should be welcomed back to the NHL with open arms. It wasn’t like he had lost all chances of continuing his career as a professional hockey player. 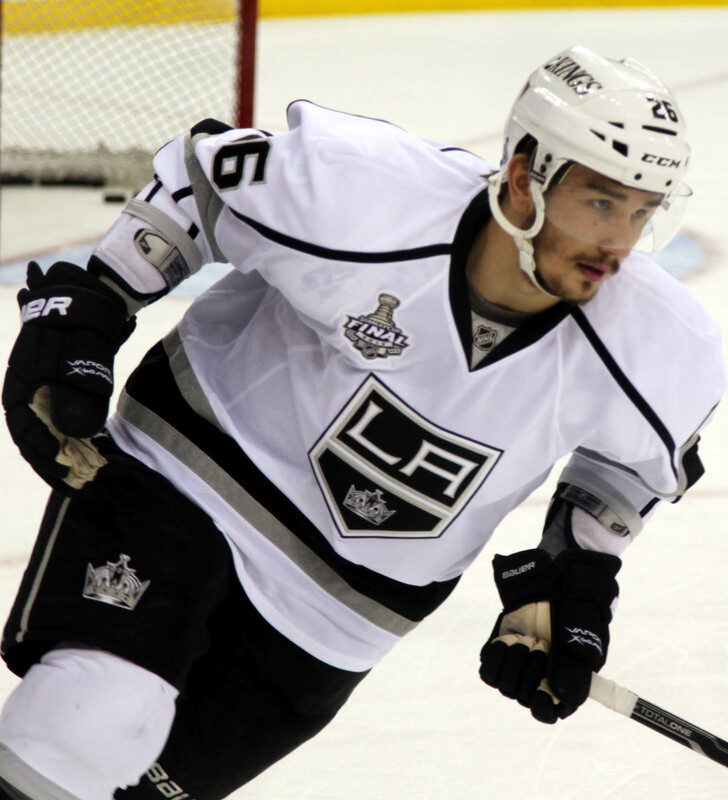 During his NHL suspension, Voynov played for SKA Saint Petersburg in the Kontinental Hockey League. He still had a job, he was still getting paid, and now that he wants to come back to the NHL, there are teams that are interested in having him on their roster. Clearly, his domestic assault misdemeanor has not been a death sentence for him, and even if he is not allowed back in the NHL, I’m sure he’ll manage to find a way to pay the bills just fine. Let’s take a look at another domestic violence cases in the NHL. In June 2018, Nashville Predators forward Austin Watson was arrested for assaulting his girlfriend at a gas station. As a result, he was given a 27-game suspension, meaning he would not be able to play until the team’s matchup against the Buffalo Sabres Dec. 3. Watson appealed the NHL’s decision, and in early October, his suspension was reduced to 18 games. He is now eligible to begin playing again in Nov. 15’s game against the Arizona Coyotes. Although domestic violence is a problem much less frequently discussed in the NHL, it is still a major issue that needs to become a priority for the league as a whole. The NHL does not currently have a set policy on how it handles domestic violence cases. The NBA, MLB and NFL all have set guidelines for how they handle these cases. If the NHL continues determining punishment on a case-by-case basis, it could potentially cause a snowball effect in which leniency is offered before serious punishment is. Determining each case individually allows more potential to pit each case against one another and develop a “Well, X is not as bad as Y” mentality. When discussing these cases within the NHL, it seems that comparisons are often made to how other leagues address domestic violence and still allow these players to play with little-to-no repercussions. Harrison, a former Pittsburgh Steelers linebacker, was charged in 2008 for assaulting his girlfriend. The charges were eventually dropped, and Harrison continued to play for the Steelers without any repercussions. Drawing these comparisons ultimately helps perpetuate this toxic rhetoric surrounding domestic violence in professional sports. Just because Harrison did not face any repercussions for his actions does not mean that should have been how the NFL handled his case, nor does it mean that’s how all other cases across all other leagues should be addressed. The NHL has an opportunity here to change the rhetoric around domestic violence. It doesn’t have a set policy, and this is their chance to make a statement not only within the NHL but within all professional sports leagues. Hand out stricter punishment and stand by these punishments. Bar Voynov from being able to return to the NHL. Send the message that domestic violence should not and will not be tolerated in the league, because these players should be facing strict consequences for their actions and not just let off with a slap on the wrist.